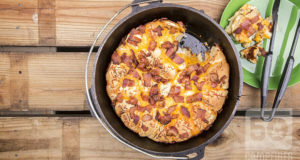 There’s nothing better than bacon and roasting up a nice meal over a campfire, so why not combine the two? 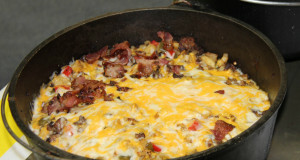 We’ve provided a list of bacon cooking essentials you can use over a fire or on a grill at the campsite to cook up your favorite style of bacon over the campfire… morning, noon, or night! This neat 5-inch folding campfire stove is great for all sorts of cooking and it’s so easy to bring wherever you may need. 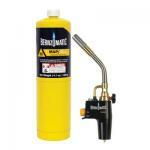 It’s a multi-fuel product that burns with wood, fuel tablets, wood pellets, or charcoal briquettes. 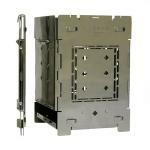 It’s durability and size allows one to use a variety of different cooking methods to cook over its heat source. You can put things as large as a Dutch oven, or as small as a camping cup on top and it will work great for both. There is no assembly required, as all you have to do is open it up when you’re ready to cook, choose your fuel source, and your portable fire is ready for action. I’m sure a frying pan comes to no surprise for gear to cook bacon, but most often you have used one on your stove at home. 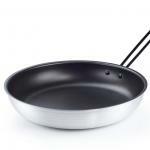 Frying pans also work great over an open flame, especially nonstick pans! You could even start up that firebox we talked about and place your pan right on top. 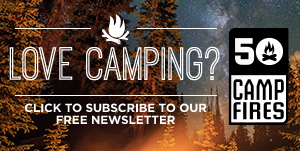 It’s sturdy enough to hold your frying pan and it will be just like cooking bacon at home, except even better, because you’ll be at the campsite. 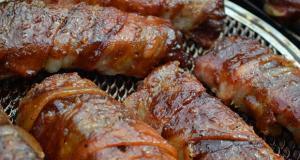 If you’re looking for an easy way to cook bacon over the grill, this is what you need. This Bacon Grilling Rack works great for any style of bacon and gives you that grill taste without the hassle of cooking directly on the grates. Most often, the bacon grease drips down into the flames and causes slight flare-ups, but with this grilling rack you prevent that from happening. This product has dual troughs to catch the grease before it falls into your grill. Awesome. 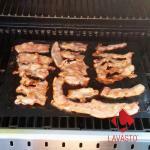 The surface of the grilling rack is also non-stick, so no worrying about not being able to get your bacon off the rack. 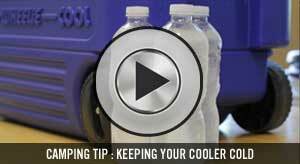 It’s easy to use, it folds up nice and tight for neat storage, and makes clean up a breeze! You just can’t go wrong buying bacon on the slab! 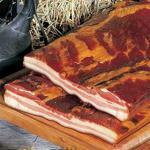 Burger’s Smokehouse Country Bacon Slab allows you to do just that. 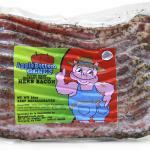 They offer hickory smoked country bacon slabs for you to slice the way you prefer. Slabs are trimmed from choice, carefully selected, corn-fed porkers then cured and smokehouse smoked to a golden brown with hickory sawdust. Can you say delicious? An extendable roasting stick is great for hot dogs and marshmallows over a fire, but it is also great for bacon! 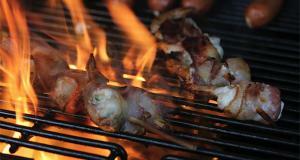 Weave your bacon through each side of the stick and hold it right over the fire. 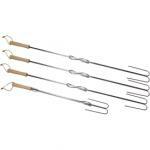 Each one of the roasting sticks features reversed wire holders with easy grip wooden handles. They’re easy to transport and are extra safe. These specific sticks from Camp Chef reach lengths up to 30” when extended and are about 19 ½-inches when closed. You’re telling me I can torch my bacon? Yeah, this is something that will shock your friends and family when they come over for Sunday brunch. Surprisingly, torching your bacon actually produces a very tasty and smoky flavor, just like what you would get over your grill or a campfire. Make sure you wear the proper safety gear when using a torch to cook! Try out a pre-seasoned, ready to use cast iron griddle like this one for your next bacon recipe. 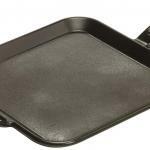 The Pro-Logic Cast Iron Square Grill Pan is a 12-inch square with ¾-inch deep sides, making it ideal for cooking bacon, eggs, sausage, hash browns, French toast, and pancakes. Try these 100% non-stick, reusable grill mats the next time you’re looking to whip up some bacon. You’ll save money with this grilling mat by using it thousands of times. For cleaning, just wipe it down with a paper towel, use soapy water, or throw it in the dishwasher. These grill mats are heavy duty, professional grade, making them heat resistant up to 500°F. They’ll also prevents flare ups, leaving you with the grill marks you love to see. 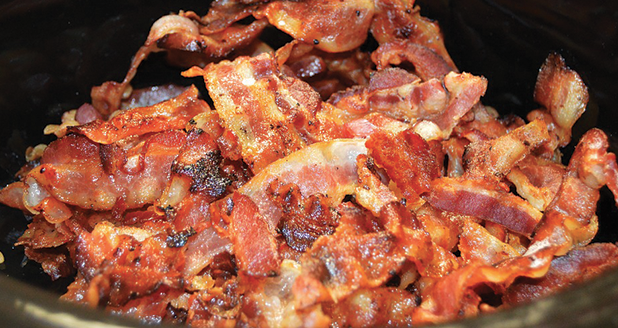 Even the best-cut bacon can curl, making it difficult to cook evenly. 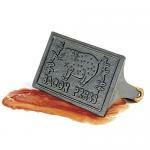 This cast iron bacon press flattens the bacon, keeping its shape and allowing for even cooking. The wooden handle stays cool while the press is in use, so no worries about burning your hands. To speed up the process, you can even pre-heat the press. 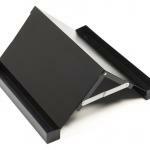 You can even use it for flattening hamburgers, grilled sandwiches, or quesadillas. You will need to season the press by coating it with oil and heating it for 20 minutes; after cleaning it in soapy water, it should also be lightly coated with vegetable oil to prevent rust. Love cooking with herbs? Well you won’t need to gather herbs with this bacon! It’s all in there: garlic, rosemary, tarragon, and thyme. 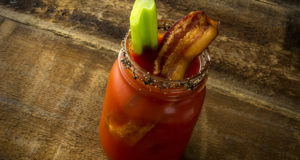 Who knew herb bacon could be so addictive? With its generous coating of hand-rubbed herbs, this bacon will fill your home with a delicious savory aroma. 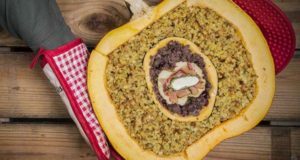 Although it’s delicious all on its own, you can also add it to any recipe that calls for an extra layer of flavor.